In chronic musculoskeletal manifestations, repair and regeneration of the affected tissues play an important role in overall rehabilitation of the joint structure. Enriched with Masha (Black Lentils), Dashamoola and approximately 25 other nourishing and revitalizing herbs processed in cow’s milk and sesame oil, Mahamash Taila is the perfect therapeutic massage oil for damaging and degenerating disorders. Besides ameliorating pain, stiffness and swelling of the involved structures, this highly nurturing oil significantly repairs and re-energizes the damaged structures as well. This herbal massage oil considerably improves the functioning and mobility of the joints and affected structures, while endowing them the vital nourishment from within. 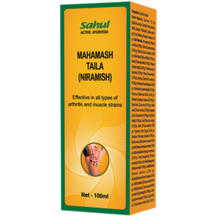 Apply Mahamash Taila (Niramish) on the affected area 2-3 times a day or as directed by the Physician. The affected area is recommended to be kept covered and warm to avoid any kind of exposure.